This is a drawing I did a few months ago. My husband went out to play poker at a nearby dog race track (he very rarely plays) and I wanted to get out of the house so I took my sketchpad, sat myself down and started to doodle. I really liked this one, and I wish it would have scanned better, but my scanner is a little too small for this sketchpad. I need to remember that. I also might come back and recolor this at some point, but I wanted to get it posted soon since I haven’t shared anything with you lovely people for a few weeks. 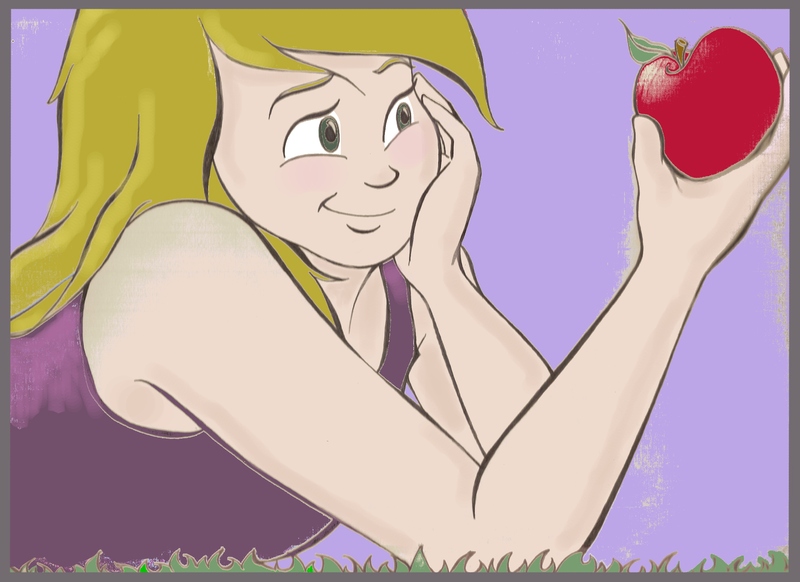 I’m honestly not really sure where the pose came from, but I really like the apple. Has some Biblical implications. And the title came from my favorite band, Coldplay. I like to think the apple is a symbol for what paradise will be like someday. Apples have a bad rap for being the initial carrier of sin (which may be a bad interpretation anyway). Yet God made apples so delicious and beautiful that it almost hints to a more perfect world beyond ours that God is dying (or rather, His Son died) to usher us into to spend forever with Him. Just read through Revelation, and you can’t help yourself but dream of Paradise. Whatever your interpretation, I hope you enjoy. wonderful picture, u r talented! that pic is so good it inspires me to draw one like it, it really grabs ones eyes. Thanks, Brad! Glad you enjoy it! If you do get around to drawing something based on this, please let me know. I’d love to see it. Thank you, dudubeauty! I love being able to tell a story through my art, and hopefully it’s always God’s story. He is our inspiration, no? 🙂 I love your posts, too. You always seem to show God’s love on your face. Keep shining for Him!